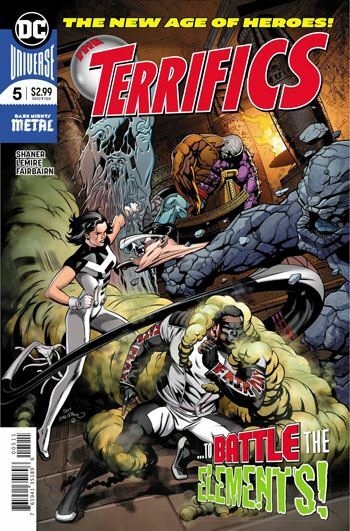 A very old foe of Metamorpho makes a return in the latest issue of The Terrifics, one who I am pleased to see back. I guess, me being me, I have to avoid saying who it is, but the character is well suited to be an arch-enemy of the elemental hero, even though he only appeared way back in the 1960s, in Metamorpho’s book from that time. But the action does not get going right off the bat. First, there is further development on three of the characters, all dealing with their personal lives. Since Phantom Girl had her family issues dealt with recently, the other three have their touched on. For Metamorpho, this involves bringing back the standard plot line, of him trying to convince Sapphire Stagg to ditch her malevolent, controlling father, while Java keeps making life miserable for the hero. For Plastic Man, this involves a phone call to his abandoned wife, and a conversation about their child. That is hardly out of the blue. Plastic Man has been shown to have a son in three different periods, since DC has been publishing the character. First in the 60s, an adult version who took over his father’s mantle. Then there was Offspring, the version introduced in Kingdom Come, and then another take on that in JLA. I am curious to see what this book will give us, in terms of his child. Phantom Girl questions Mr Terrific about his personal life, and he is as evasive as possible. In times past, it was the death of his wife that started Michael Holt down the path to becoming a costumed hero, but we have been through so many reality altering events since then that I am unsure if that is still part of his backstory, or if something new is being set up here. And while I did love this issue, as I have the previous four of this series, I am wondering about how the book relates to the new Plastic Man series. Here he wears the black and white costume he recently received, but in his solo book he is in his more familiar uniform, and perfectly capable of being away from the other members of the team with no ill effects. I hope that gets dealt with, either here or in his own book. And last but not least, we get an Element Dog introduced. Seriously, how can you go wrong?